Style is very subjective. What could be someone’s style heaven will almost certainly be someone else’s nightmare. Style can be minimalist it can be elegant, it can be colour and it can be stark. And a flower is only stylish if it is used stylishly! So if you are creating a display in a home other than yours be sure you look around you and get a feel for what they like otherwise even the most beautiful flowers won’t look quite so beautiful or stylish. Don’t put tall elegant displays in a cosy cottage and likewise don’t even think about putting country casual in a penthouse flat! But if it is your home you already know your style and by keeping in mind your colour harmony (link to colour harmony section) you really can create something stunning which has immediate impact. As well as your colour harmonies you should have in mind a design for your display – do you want it free form or geometric? You should consider height, width and dimension as well as depth. All displays should have a focal point to attract and draw in the eye. You can do this by using large flowers, lines of the same flowers; group of flowers or colour and by contrasting colours, textures and height. It is important to keep these principles in mind when you start off.Also keep in mind the type of vase, pot or container you use. Containers should match, contrast, complement but definitely not clash with any flowers or foliage. China, ceramic and glass vases are much more sophisticated than a pot or jug. Glass vases in particular lend themselves to bold uncomplicated designs. Tall lilies, vibrant gerberas and stems of roses look elegant and chic in these and will certainly be eye-catching. Expensive plain ceramic containers ooze style when used with roses and lots of foliage. If your container is patterned use one colour flower only which complements it otherwise you will have two mediums competing for attention! When you want style in the home, less is definitely more. A couple of flowers and a few accessories are all you need to make instant impact. 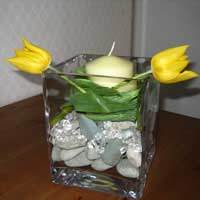 If in season using tulips, or gerbera can work equally well – basically any flower that you like that has a “bendy” stem; square glass vase; church candle; stones and glass beads. Ensure that your vase is clean and place the candle in the centre of the vase securing it with florists’ fix. Always make sure that the candle rises above the edge of the vase to avoid setting the flowers on fire! Bend one flower around the vase one way and bend the other in an opposite direction to create a swirl effect. You can make the same display without the candle and still have an equally stunning effect. Tulips swirled inside a glass fish bowl (minus the fish or course!) with their heads just popping out of the water, looks amazing. To add extra effect you could colour the water to match a theme. The thing to remember is never to overcook your display if it’s style you are after. If you are using bold flowers stay minimalist and tall and remember to balance out your flowers.Always have in the back of your mind: design, proportion, harmony and balance and you can’t go wrong.